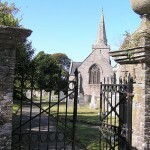 Bigbury’s church (dedicated to St Lawrence) is partly early 14th century and partly as rebuilt by J. D. Sedding in 1872. Apart from the western tower topped by a spire very little is obviously medieval. The two monumental brasses are early 15th century. The baptismal font, sedilia and piscina are early 14th century, while the lectern and pulpit date from the following century. Both the lectern and pulpit were moved here from Ashburton church: the lectern is attributed to Thomas Prideaux and thought to be a donation of the Bishop of Exeter ca. 1510-15.